Stone & Boulders are a low maintenance feature you can use in landscaping to create clean, maintainable garden beds & features. Mulch is a low cost & effective way to dress up gardens, & can be used to prevent moisture from evaporating before your plants make use of the moisture. 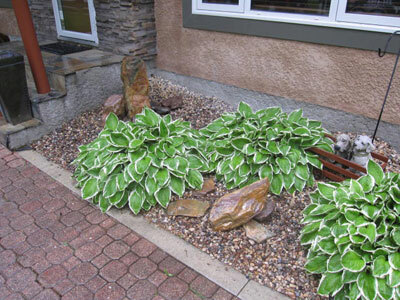 Rocks, stones & boulders offer a solid way to accent your yard with strong & permanent features. Granites, shale, & rounded stones offer textures & colour of nature. When combined with garden areas & water features you harness another level of landscaping, and we do this with great results. 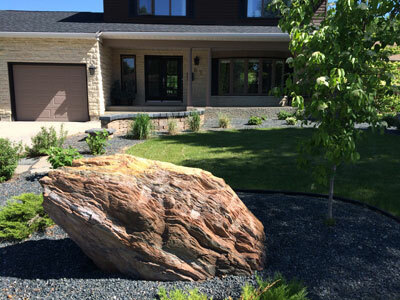 The presence of a boulder beside the driveway, and cascading accent stones offer a unique way to set off your home. Mulch offers fresh smelling cedar & enviro mulches that have great colour & function, we can also refresh existing mulch with a top-up. Boulders, stone & mulch all come in various colours & can be chosen based on house colour and personal taste. We can present you with all of best options for you, to create a unique & relaxing yard. Perhaps you are just moving in, or preparing to sell. Proper landscaping can raise your property value by as much as 20%, so investing in this part of your home is money well spent. We can change existing landscapes to your taste, or start fresh. Plan your landscape with us, and watch your yard come to life.